Not sure why solar stocks are up 20% across the board today but all 3 of our issues are up 15-20% so we're taking more profits here. Wish I had waited with some of the solar selling we did last week. Maybe an "Obama" victory is being priced in but that seems silly to move these stocks up. 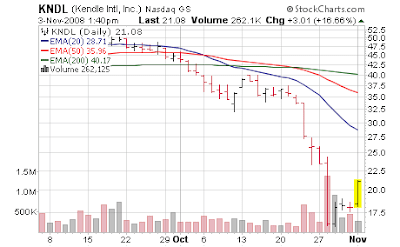 I bought Kendle International (KNDL) Friday on anticipation of earnings report and oversold condition - a 20% run would of been a nice, but I expected that over a few weeks. Today we are up nearly 17% so basically the target has been hit before earnings; I'm going to cut back 1/3rd of the position since the opportunity is offered. Kendle drops from a 3.2% stake to 2.1%. But the name is STILL far below any meaningful resistance area. I also took a bit off A-Power Energy (APWR) this morning up 10% as it appears to now trade with the solar stocks all in 1 complex.